Nothing gets my blood pumping harder than a spicy montage of licensed merchandise set to some riff-heavy metal. Who doesn’t like their merch and metal as sludgy as possible? Lucky for me, Blizzard put out one such montage at their San Diego Comic-con panel. On display are a plethora of plushies, mugs, and vinyl figures. Not sure who you are? 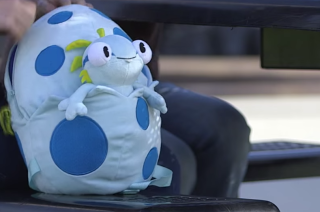 Try on the Murloc Egg Backpack and ask again. That empty spot on your desk? Obliterate it with a massive Tracer statue from Overwatch. Have a fridge? Good. Make it unrecognizable with cutesy-wootsy Starcraft magnets. Fill all your free space and crystalize your identity with stuff! Jokes aside, there is quite a variety on its way for true blue Blizzard fan and I’d be lying if I didn’t actually visualize the Hearthstone Box Replica as a stand or storage for my amiibo collection. As a treat for attendees, some of the products are only available at SDCC this year. But the rest is available in Blizzard’s store.